When I was growing up in the 1970s, the only cooking oil I remember my mother using was an unnamed generic vegetable oil that was pale yellow, rather ‘thin’ in consistency and very bland. Fortunately culinary oils have moved on in the past few years and now there is a huge variety available which then begs the question, which one do you choose? As we don’t fry food in our house and my husband has a heart condition, he likes extra virgin olive oil and swears by its healthy properties i.e. the Mediterranean diet. I find olive oil too rich and so I hunted around for an alternative: a lighter oil that was also good for you. What I eventually chose after some research (how did we ever manage without Google?) was gloriously golden rapeseed oil, which has less than half the saturated fat of olive oil. I’ve tried a few brands over the years and personally prefer it now to olive oil. I was therefore very pleased to be asked by ‘My Foodie Heaven’, the Artisan & Speciality Food online magazine, to review ‘Borderfields’ cold pressed British rapeseed oil and a couple of their infused rapeseed oils. I was provided with a selection of oils and asked to review them honestly and come up with a couple of recipes if I was happy with the product. Luckily, I loved the product and had a lot of fun creating recipes with it. Firstly, I’ll cover the technical stuff: Borderfields has a near perfect blend of Omega 3 and 6 which are considered to be essential fatty acids because the body cannot manufacture them, plus Omega 9. In fact the omega 3 content is ten times more than you find in olive oil. Borderfields is also a good source of Vitamin E which is known for its antioxidant properties. Borderfields rapeseed oil can be used as a healthy replacement for butter and when baking as well as for dressings, dips, roasts and stir fries. I was keen to devise some recipes which would allow the flavour of the oil to shine through without overpowering the other ingredients so what I did first was to test out the garlic infused rapeseed oil on the humble potato. Many people swear by using goose fat for the best roast potatoes but of course vegetarians and vegans can’t eat that and even though I eat meat, for some reason I’m a little squeamish about using goose fat. So last weekend, I part boiled some Maris Piper potatoes, cut them into chunks and tipped them into a baking tray of hot garlic infused rapeseed oil, tossed them around and put them in a 200 degree C / Gas mark 7 / 400 degree F for 30 minutes. I then turned them over in the pan and put them back in the oven for another half hour. 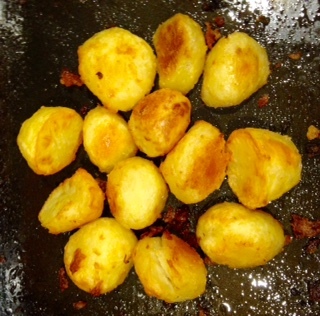 The result was the perfect roastie: soft and fluffy inside and crispy on the outside with a beautiful golden colour and a buttery taste that make you want to dive right in. 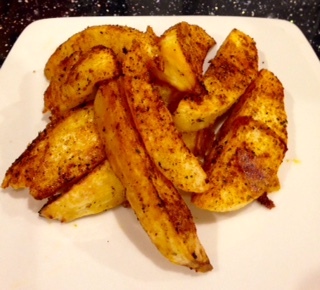 Later in the week, I made spicy garlic potato wedges, also using the garlic infused rapeseed oil. Again, I part boiled the potatoes and cut them into chunky wedges, placed them in a tray of hot oil then sprinkled Barbecue Spice and chilli flakes (from the supermarket) over the top. These needed less time in the oven (same temperatures as for the roast potatoes) so I gave them 20 minutes, then turned them, then gave them 20 minutes more. These definitely had a kick to them and were crunchy and delicious. I found it hard not to keep taking one to ‘test’! Spoon some of the tomato mixture onto each slice in a little pile and drizzle over a little more of the basil oil. 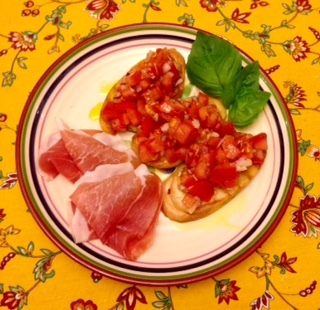 Artfully place two or three small basil leaves on or around the bruschetta to garnish then serve. The infused basil oil in this recipe adds a subtle basil flavour to the dish and enhances the flavours of the rest of the ingredients. Basil and tomatoes is a traditional combination but the addition of some chilli gives the dish a little twist. The bruschetta is great on its own as a grab and go snack but if you add some Italian cold meats and a glass of wine like we did, it’s even better! Finally, to continue the Italian theme, I decided to create a pesto sauce with the Borderfields cold pressed British rapeseed oil. I like making things that can be kept in the fridge for a while and whipped out to make a fast and tasty meal, as I’m usually pretty pooped by the time I get home from work. Most pesto recipes require you to use pine nuts, which are lovely but expensive and also a bit ‘fatty’ in taste. Also, if you keep them a little too long in the cupboard, they go rancid. I therefore chose to use walnuts as a lot of people are likely to have them in their food cupboards and they are reasonably cheap. With the food processor running at a low speed, slowly add the rapeseed oil through the feeder tube until incorporated. Turn food processor off. Add the grated parmesan cheese and the lemon juice and pulse a few times until blended in. You should have a reasonably thick pesto sauce that has a bit of texture. 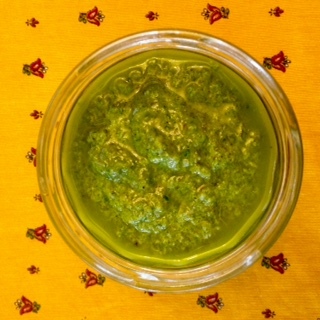 Put the pesto mix into a small glass jar and refrigerate for up to two weeks. You can use the pesto on pasta, tomato and mozzarella salad, potatoes and anything else you fancy! You’ll see that I had a great time trying out the Borderfields rapeseed oils and I’d certainly recommend them for both flavour and versatility. It’s also great that they are produced in the UK and available all year round. You can find out more information about Borderfields products (including other infused rapeseed oils like chilli and lemon) on their website: http://www.borderfields.co.uk. Disclaimer: although I was given samples of Borderfields products to review, my opinions represent my honest feedback on the goods provided. I was not paid to write the review nor did I receive any other financial incentives.